Millions of workers around the world are facing different levels of risks and hazards at workplaces which sometimes cost their lives or maim them permanently. Several safety standards and regulations imposed by countries notwithstanding, there have been many instances of disasters and accidents at workplaces around the world signaling the need for industries to take safety measures seriously in order to safeguard workers, properties and environment. Occupational safety and health is a specialized field where one needs experienced professionals and experts for creating congenial atmosphere for working populace. There are several safety and health standards and regulations formulated by international organizations and educational boards which offer certifications to professionals through a network of accredited institutions around the world. Green World Group is an international Health & Safety educational institution which has been helping students to gain certifications from well-known educational boards’ accredited courses such as IOSH, NEBOSH, HABC , IRCA lead auditor, National Diploma (Indian Govt. approved) and several tailor made courses to meet the needs of students and working professionals. The National Examination Board in Occupational Safety and Health (NEBOSH) is an educational board based in UK which offers most reputed safety and health courses at Green World Group’s centres spread both across India and abroad. NEBOSH certifications are highly regarded by employers and governments around the world. Green World Group in India offers International General Certificate (NEBOSH IGC) through its various centres. NEBOSH IGC is the most-sought after diploma course on occupational safety and health domain as it is designed especially for aspiring students and those who wish to train themselves to become highly acclaimed HSE professionals in their career. The curriculum covers all aspects of providing safety standards and principles, different workplace hazards, risks, dangers and health issues, tools to identify potential dangers, effective risks management and measures to create safe and healthy work surroundings. More so, NEBOSH IGC provides students a perfect platform to upgrade them further with several advanced studies and also help them get prestigious professional memberships. 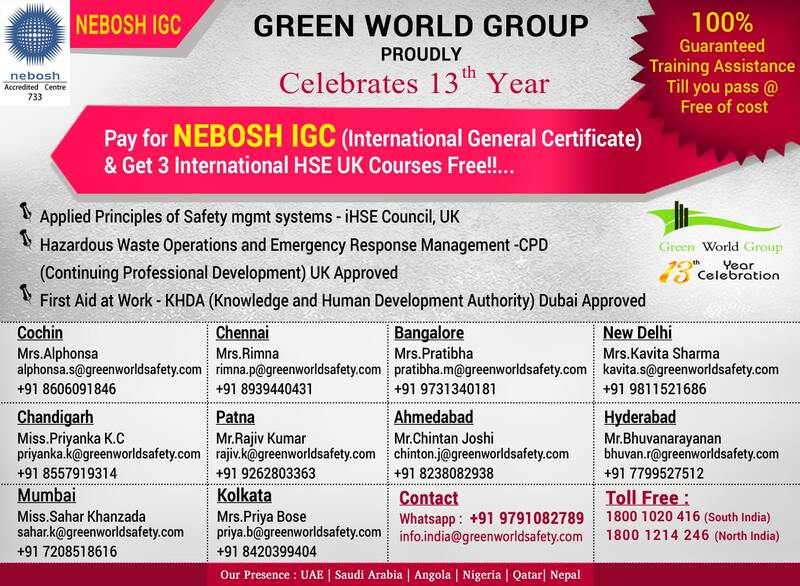 Students can enroll for NEBOSH IGC course at Green World Group’s centres in New Delhi, Mumbai, Kolkata, Ahmadabad, Chennai, Hyderabad, Cochin and Bangalore. Hurry! Book your seat now and become a successful HSE professional right away.